Review date: 8 July 2005. 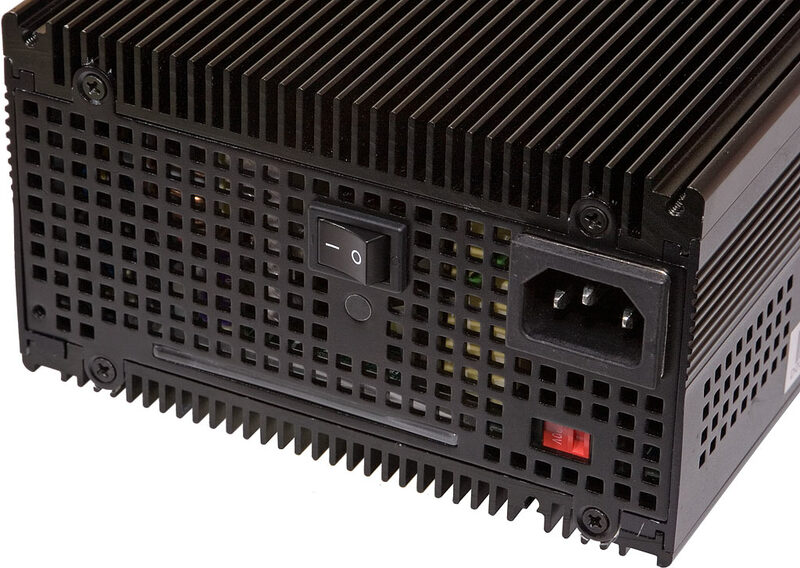 Silent power supplies for PCs are, basically, a big gyp. PCs are, you see, meant to be cooled by air flowing through them. Plain free convection doesn't cut it; you need at least one fan for any normal PC. A lot of PC parts are happy running at surprisingly high temperatures - just because you can't hold your finger on your hard drive doesn't mean it's destined for an early grave - but if there's no ventilation at all, any normal PC will get really hot, and then proceed directly to the scene of the crash. Fans make noise. So, obviously, a truly silent computer has to have (among other things) a silent power supply, with no fan. Good luck making such a system work, though, unless you opt for weedy Eden boards and laptop drives. Yes, careful design and component choice has produced some decent fanless computers over the years, but modern PC components make it very, very hard. The most straightforward way to achieve the fanless feat with normal components is by using Zalman's giant fanless cases, which're definitely an engineering landmark. But just the case by itself costs as much as a whole low noise P4 system, plus half the price of an OK monitor. Water cooling doesn't solve the problem, because you need a radiator, and the radiator needs a fan. You could use an irrationally gigantic radiator (Zalman have a product for that too, though not for really hot systems), which'd probably be OK for passive cooling, or a small radiator with fan on the end of a lot of tubing that you could put far, far away. But then you'd need a more powerful pump, which might break your noise budget by itself. Or you could just connect a cold tap to the input of your water cooling rig and let the warm exhaust water dribble into the drain or somewhere, but then environmentalists would beat you to death with naturally fallen, non-truck-transported sticks. So truly fanless x86-compatible computing is difficult, if not impossible, to achieve. Better to settle for low noise computing, where your PC makes no more racket than, say, a gentle breeze in the trees outside. That's much easier. Back in the day when CPUs didn't even need fans on them, a single weedy fan in the power supply was more than good enough to haul air through any desktop or tower machine that wasn't packed full of disk drives. Even after everything got crusted up with dust, even if the back of the case was quite hard up against the wall, even if you put the thing on shag pile carpet, it'd be OK. Those old beige-box PSU fans were generally pretty quiet, and could be made quieter still if you swapped them out for a lower power unit (PSU fans are always 12V DC units, usually 80mm), and added a similarly quiet intake fan at the front of the case to take up the slack. Today, you need more throughflow, but most cases are designed with this in mind - all kinds of cheap cases at least have mounting locations for multiple fans, and may come with them as standard equipment. If you make those fans low powered and, preferably, big (a 120mm fan can move around twice as much air as an 80mm unit, for the same noise and power budget), and you're vigilant about dust clogs, you can easily keep even a quite tweaky machine quiet and cool, as long as your ambient temperature isn't too outrageous. So where do "silent" PSUs fit into all this? Well, there are two basic kinds. Each one rips you off in a different way. The first kind of silent PSU isn't actually silent, ever. It's got a fan in it, and the fan runs all the time, but it's thermally controlled - if the PSU isn't hot, the fan runs slowly enough that you can hardly hear it. If the air flowing over the fan's thermal sensor is hot, the thing speeds up, to the noise level of a normal beige-box PSU, or higher. 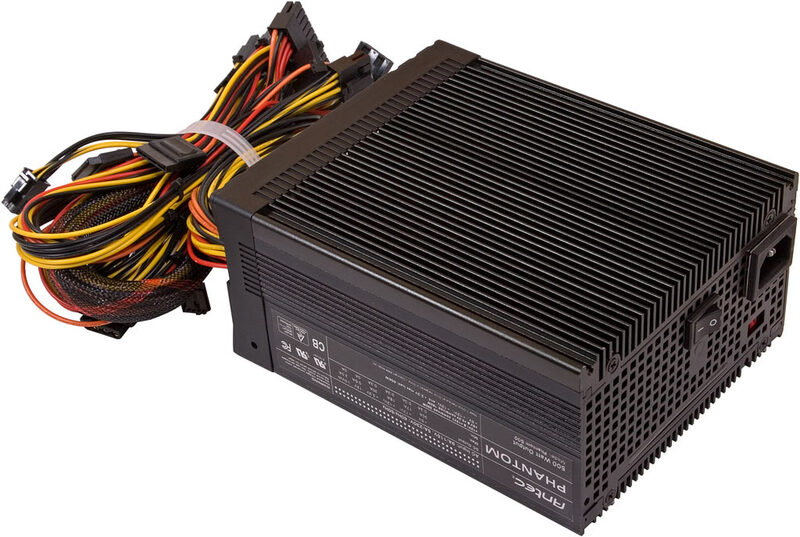 There's nothing wrong with these kinds of PSUs; correctly designed, they can work very well. They usually don't have enough fan power to ventilate a whole case all by themselves, but along with an intake fan or two, they'll get the job done. They can even be pretty close to silent, if they use two really low powered 80mm fans, or one 120mm (like this, or this). But they're not silent. The second kind of "silent" PSU has no fan, so it's as close as any PSU can actually get to really being silent (no PSU is truly silent - there'll always be some level of magnetostrictive hum). 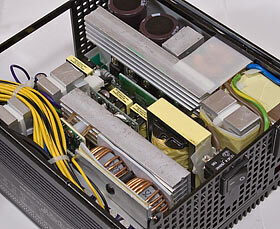 A fanless PSU still needs ventilation, though. So, all things being equal, you need more air flow through your computer case to keep the fanless PSU cool. And, because you probably don't have a thermal sensor inside the PSU casing to tell you how hot it's getting, it's a good idea to overspecify your extra air flow to make sure the PSU doesn't bake. Which can leave you with a louder system than if you went for a fan-equipped "silent" PSU. Into these murky waters swim Antec, with their Phantom 500. It's not the cheapest PSU you can get. It's certainly not the smallest, or the lightest (which also means it's not the easiest to install). But it's definitely among the quietest. Here in Australia, Aus PC Market stock the Phantom 500 for $AU264 including delivery anywhere in the country - which ain't bad, for a 3.4 kilogram lump like this thing. They also stock the smaller Phantom 350, which is $AU207.90 delivered. The 500 and the 350 are almost the same thing. The only difference between them is that the Phantom has a fan bolted onto it. 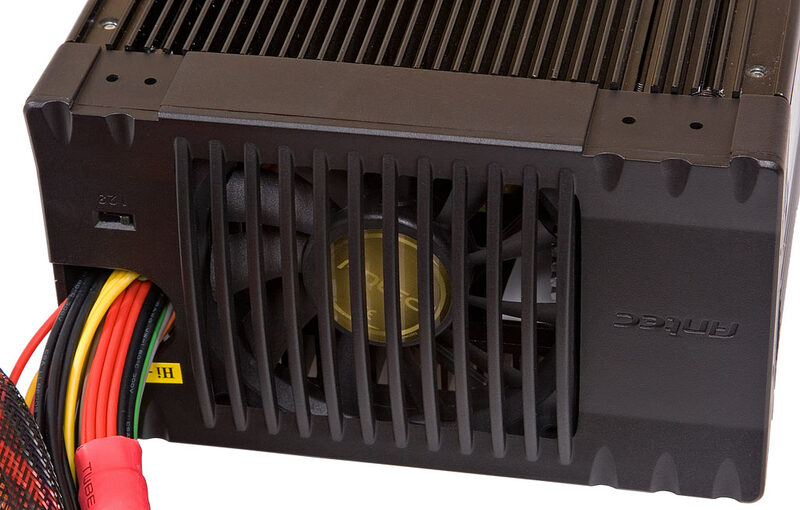 Unusually, the fan faces into the computer case when the PSU's installed - though it blows in the usual exhaust direction. 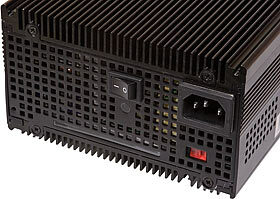 Antec call the Phantom 500 a "hybrid fan" PSU, by which they mean that it only turns on its fan when it has to. The little slider switch to the left of the fan in the above picture determines the thermal threshold for the fan to turn on - 40, 47.5 or 55°C. The fan's also got a thermal speed controller, so its startup speed is slow and quiet. It's a many-bladed slimline 1.7 watt unit, so at full blast it's about as loud as many regular grey-steel-box PSU fans - but because it's on the inside face of the PSU, not as much noise makes it to the outside world. Because the fan's on the other end, the side of the Phantom that faces the world is basically just one big grille. This is, I think, the "rest-of-world" version of the Phantom 500, as opposed to the "Euro" version. I can tell, because the rest-of-world version has a good old fashioned red voltage selector switch, so you can use it in 110/120V or 220/240V countries. Many PSUs these days are automatically world-compatible, and don't give you the Switch Of Doom; the Euro version of the Phantom is like that. But the Euro version also has Power Factor Correction. If you're a home or small business computer user, you very probably don't need to worry about PFC, unless you feel philanthropically inclined towards your power company; I explain why here. This no-PFC version of the Phantom is actually preferable for most users, because it's more efficient. 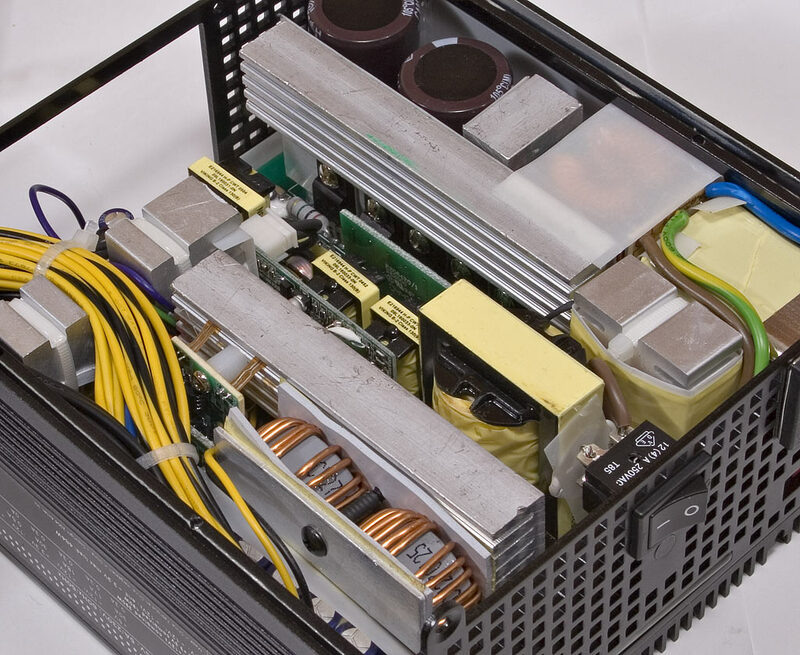 All computer power supplies are switchmode units, which means they're much more efficient than simpler linear supplies, not to mention far smaller and lighter. Switchmode supplies are routinely good for 80% or better efficiency. 80% efficiency means that eight out of every 10 watts of power the PSU draws from the wall is converted to DC and fed to the computer. The other two watts end up as heat. This is obviously important for silent computing applications, because it's heat that forces you to install huge stupid fans. Antec's quoted efficiency for this no-PFC Phantom is 86%; the Euro version only scores 82%. Very few computers are actually going to push a high-rated PSU like the Phantom 500 - or even the Phantom 350, for that matter - to its limits; a really stacked machine is more likely to need about 200 watts when working hard. 200 watts at 86% efficiency means you're getting rid of 28 watts of heat from the PSU alone; 82% efficiency pushes that up to 36 watts. That's not a huge difference, but every little bit helps when you're trying to run with minimal fan noise. People with better PSU test rigs than me report that their no-PFC Phantom 500 manages almost 90% efficiency under heavy load. Inside, the 500's a tight-packed unit, which isn't good news for ventilation. There's a channel of sorts down the middle, though, and the grooves in the heat sinks point that way (which, surprisingly enough, is not always the case...). The heat-sink-finned lid of the PSU also has tape that gives it a bit of thermal coupling to the heat sinks and other components. All of that metal comes at a price, though. All ATX PSUs have the same 86mm height and 150mm width, but many of them are only about 140mm deep, and weigh a couple of kilos, at most. The Phantom 500 is 183mm deep and weighs 3.4 kilograms, pretty evenly distributed over its whole depth, which means it won't fit at all in some PC cases, and will also try to pull its own screws out if you install it in the usual way. Antec provide a couple of dinky little brackets to help you bolt the 500 into a case; you may or may not be able to install them. Personally, I'd go for ratchetty nylon. If your PC case has a PSU mount location at the bottom, or a proper shelf for the PSU to rest on, you shouldn't have any trouble installing a Phantom 500. Well, unless there just isn't enough room for its depth. The Phantom 500 has a 24 pin EPS12V main power plug (the end four pins of which are a separate detachable unit, so you can elegantly plug it into older 20 pin boards), a mere five "Molex" drive power plugs, four SATA drive power plugs, two floppy plugs, an AUX12V 4 pin connector (the "P4 connector" used by many motherboards), an SSI eight pin connector (the updated version of the P4 connector, with even more separate wires for 12 volts; this alphabet soup is because PCs are leaning more and more totally on the 12 volt rail as the years go by), and one six pin plug for PCIe graphics cards. This is an ATX12V 2.0 compliant PSU, so it's got two separate 12 volt rails, one to feed the CPU regulators and one for everything else. The idea here is to minimise disturbance to one rail from sudden load changes on the other; from the user's point of view it's not very important, unless you're breaking out your soldering iron and splicing things in for nefarious purposes. The Phantom 500's aggregate main rail ratings - +3.3V, +5V and both +12Vs, all running at once - add up to 484 watts. 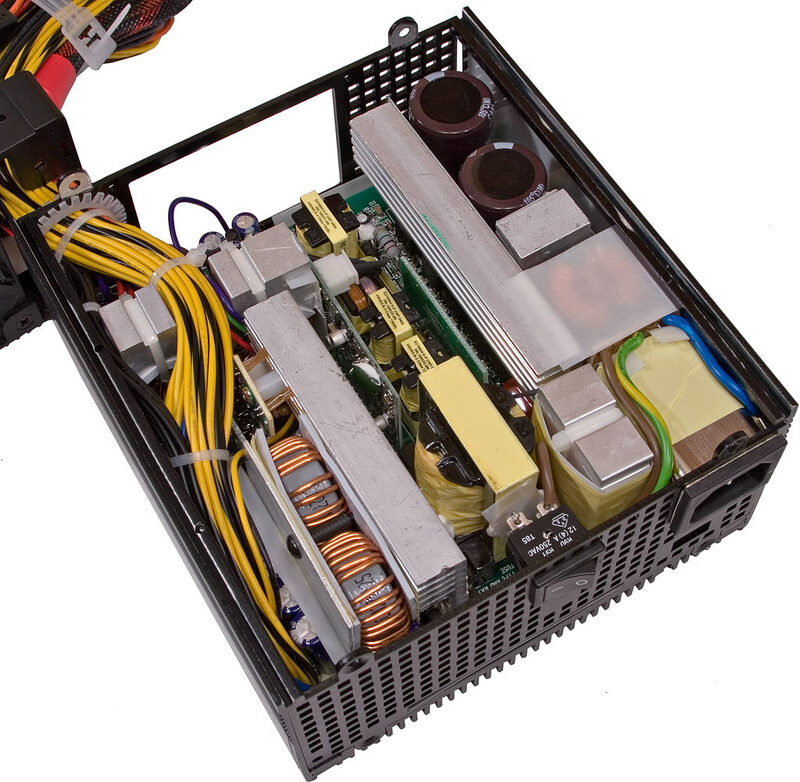 In reality, a modern PC will probably find it practically impossible to draw that much power from the PSU; a four-CPU server full of drives might get close, but the 12V-heaviness of current PC designs means the two 12V rails are likely to hit the stops before the lower voltage ones do. Unless you're really going nuts with the Peltier devices, though, you shouldn't get anywhere near the Phantom 500's redline, and its fan should run nice and slow. As mentioned above, the fan seems to be the only major difference between the Phantom 500 and the smaller, somewhat cheaper and not much lighter Phantom 350, whose nominal rating is 350 watts to the 500's, um, 500. If you strapped a fan onto a 350, you could make it work like a 500. I like my power supplies to be able to take care of their own cooling, so despite the fact that I'll probably never own a PC that can use the 500's extra headroom, I'd still drop the extra $AU56.10 for the bigger unit. Neither PSU is expensive, for what it is. If you're trying to keep your computer room noise down to a dull roar, a Phantom 500 will help. Even if you don't particularly care, though, this is a very solid power supply, in every respect. Readers from Australia or New Zealand can purchase both of Antec's Phantoms from Aus PC Market. click here for the Phantom 500!